The seminar takes place at Hood College, an independent liberal arts college known for its outstanding faculty, research opportunities, experiential learning, and beautiful campus. Hood is located in historic Frederick, MD just an hour from both Washington, DC and Baltimore. The seminar will be held in one of Hood’s “smart” classrooms that feature multimedia technology that supports modern approaches to teaching. Hood College’s Beneficial-Hodson Library and Information Technology Center will be an important resource for participants working on individual research projects; participants will be granted full library privileges during the seminar. The library provides immediate access to approximately 150,000 monographic volumes, 200 print and microform periodicals, more than 200,000 e-books, and 45,000 full-text electronic periodicals. The library offers both collaborative and individual work space and computer workstations. To encourage a collegial working environment, participants are encouraged to take advantage of the rooms that will be available in Hood’s comfortable student residence halls with wireless Internet access. Grocery stores and restaurants are available nearby, and multiple restaurants can be found in downtown Frederick, just a short 10-15-minute walk from the campus. Stay tuned for more information about our on-campus housing options – coming soon! 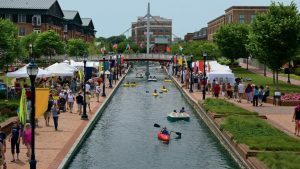 You can take an easy walk to Downtown Frederick to a vibrant Main Street, with an eclectic mix of restaurants and cafes and unique specialty shops, galleries, museums and theaters in Civil War-era buildings. Carroll Creek Park boasts a walking path with plenty of seating and public art. Just a couple of blocks from campus, Baker Park boasts 58 acres of tennis courts, softball and baseball fields, Culler Lake, a public swimming pool, playgrounds, a band shell and a walking path to Downtown Frederick. Frederick in the summer “enjoys” classic mid-Atlantic summer weather; please be prepared for heat, humidity, and the occasional summer thunderstorm. But never fear: there’s no shortage of air conditioning on campus! Each participant will receive a $2700 stipend that will help cover the costs of travel, housing, meals, and basic academic expenses. Baltimore-Washington International (BWI), Dulles, and Reagan National airports are all within an hour’s drive from campus. Taking the train or bus? Amtrak provides service to and from the BWI Rail Station, Penn Station in Baltimore and Union Station in Washington, D.C. From there, buses and taxis provide service to Frederick. Greyhound provides daily transportation to Frederick from Baltimore, Washington, D.C., New York and other major cities. From points north: Follow U.S. 15 South from Harrisburg and points north to Frederick. Take the Rosemont Avenue exit. Turn right onto Rosemont Ave. Travel approximately half a mile, and turn left at the entrance to Hood. From points west: Follow I-70 East from Hagerstown and points west. Take the first Frederick exit onto U.S. 40. Follow U.S. 40 East to U.S. 15 North to the Rosemont Avenue exit. Turn left onto Rosemont Ave. Travel approximately half a mile, and turn left at the entrance to Hood. From Washington: Follow I-270 North from Washington, D.C., toward Frederick and Gettysburg. Avoid I-70. I-270 ends and the highway becomes U.S. 15 North. Follow U.S. 15 North to the Rosemont Avenue exit. Turn left onto Rosemont Ave. Travel approximately half a mile, and turn left at the entrance to Hood. From Baltimore: Follow I-70 West from Baltimore to the junction with U.S. 15 North (Exit 53). Follow U.S. 15 North to the Rosemont Avenue exit. Turn left onto Rosemont Ave. Travel approximately half a mile, and turn left at the entrance to Hood.